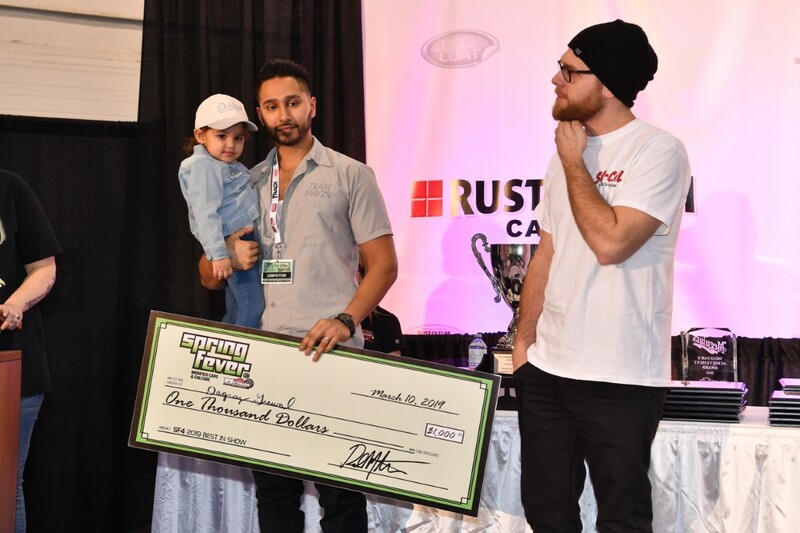 The 2019 edition of the Motorama Custom Car & Motorsports Expo wrapped up Sunday afternoon at Toronto’s International Centre. 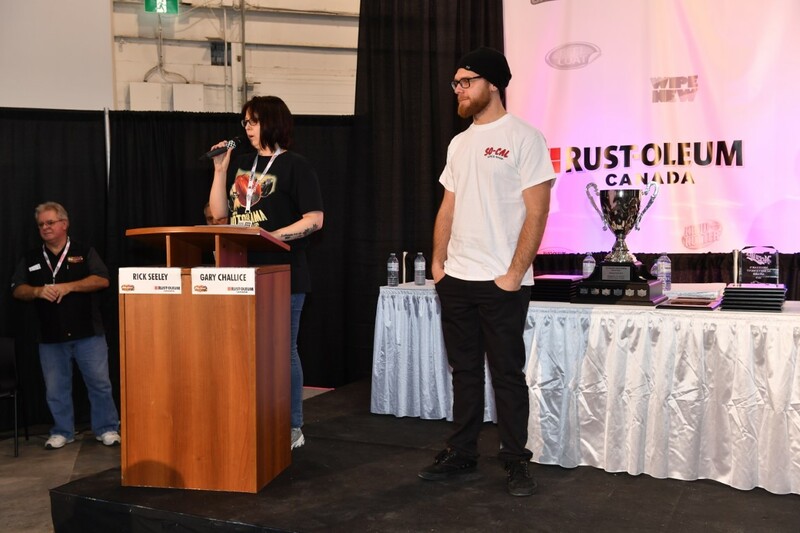 Sunday’s show car special awards presentation took place on the Rust-Oleum Stage and concluded with a 1964 Pontiac Acadian – dubbed ‘Anvil’ – being named the 2019 Motorama Grand Champion by the show’s judging staff. 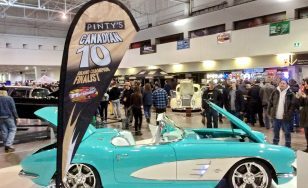 Owned by Danny, Sandy & Cody Jadresko, the JF Launier-built car was one of ten Pinty’s Canadian 10 cars identified as contenders for the show’s top prize, on Saturday. 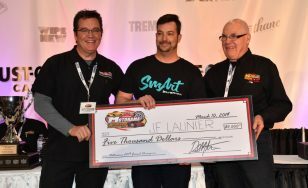 Launier accepted the Grand Champion’s trophy and the $5,000 first-prize cheque in front of a packed audience. It was the second major honour for the car in a week as it was a Great 8 car at the Detroit Autorama, last Sunday. 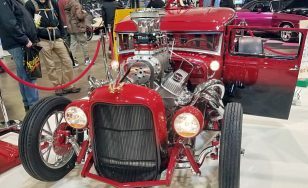 It may be cold, wet and windy outside, but it’s warm and dry inside at Toronto’s International Centre for the final day of the 2019 Motorama Custom Car & Motorsports Expo! The show is open from 10 a.m. to 5 p.m. on Sunday and offers over 400 incredible mostly first-time-shown vehicles of all kinds. Custom cars, hot rods, classics, exotics, tuners and race cars of all kinds fill the over 330,000 square feet of the show. 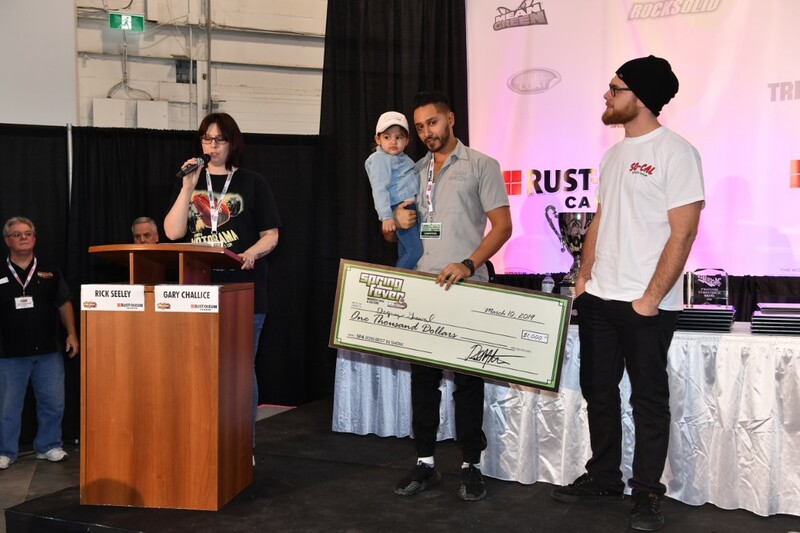 Meet Tom Smith from Misfit Garage, Bogi Lateiner from All Girls Garage (presented by BASF Canada), Lou Santiago from The Car Fix (presented by Lincoln Electric), Grant Schwartz from Seasons 2 & 3 of Vegas Rat Rods and Pinup Model Cherry Dollface. 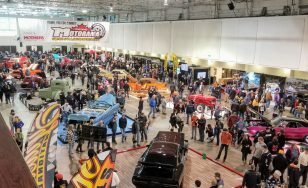 The fifth annual Motorama Custom Car & Motorsports Expo is underway all this weekend at the International Centre, across from Toronto’s Pearson Airport. 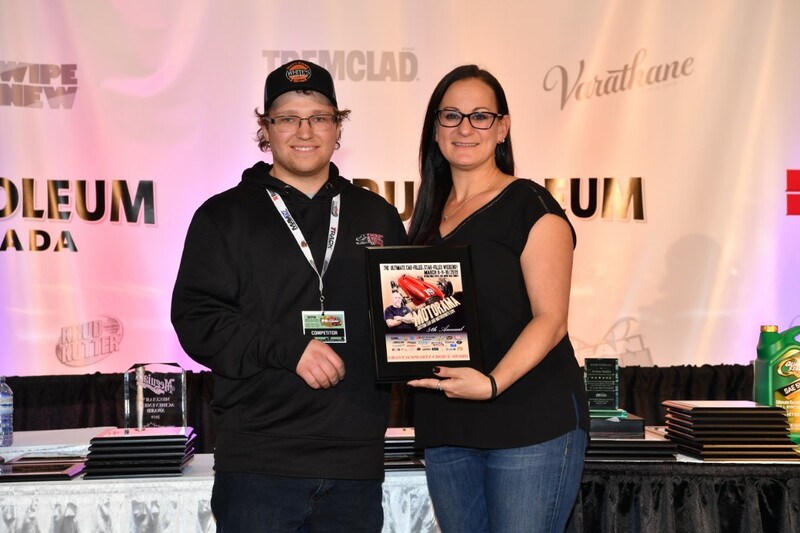 Jammed with over 400 vehicles – plus exhibitors and displays – the Motorama judging team has identified ten special vehicles that are in contention for the Motorama Grand Champion Award, which will be announced on the Rust-Oleum Stage on Sunday afternoon at 3 p.m. The Pinty’s Canadian 10 represent a wide variety of vehicles. Nine of them are located in Hall 1 and can be identified by the large Pinty’s Canadian 10 teardrop banners placed by each. The tenth car is located in the new Mayhem ‘rockabilly’ room featuring traditional customs and hot rods. After a full year of planning, the 5th Annual Motorama Custom Car & Motorsports Expo has opened its doors! 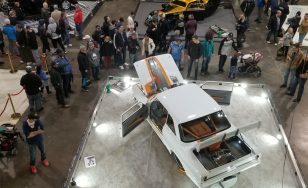 All this weekend (March 8, 9 & 10) in Halls 1, 2, 3 & 4 of Toronto’s International Centre, the Motorama Show is the largest indoor springtime exhibition of its kind in Canada. Almost 400 of the country’s premiere custom cars, hot rods, street tuners, imports and race cars are on display, with the remainder of Motorama’s 330,000 square feet of floor space filled with a massive assortment of automotive and motorsports-related vendor kiosks, race track displays, and a trio of presentation stages. 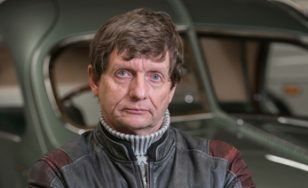 David Grainger – co-principal of Bradford, Ontario’s Guild of Automotive Restorers and star of TV’s Restoration Garage – will be in the Hagerty Insurance booth (#204) this Saturday (March 9) during the Motorama Custom Car & Motorsports Expo. Grainger will be at Motorama between noon and 4 p.m., spending time in the Hagerty Insurance display and walking the show. The fifth annual Toronto Motorama show takes place at The International Centre at 6900 Airport Road, across from Pearson Airport. Motorama runs March 8, 9 & 10. Performance Improvements is returning to the Motorama Custom Car & Motorsports Expo for a fifth consecutive year. 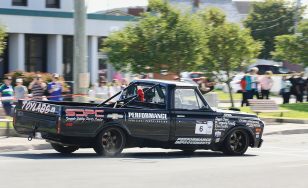 The 2019 edition of their display – in Booth #101 at the entrance to Hall 1 – will feature Mark Bovey’s 1971 GMC farm truck; the first of its kind to ever race in Targa Newfoundland. The Toronto Motorama show takes place on March 8, 9 & 10 at The International Centre, across from Toronto’s Pearson Airport. Launched nationally in 2018, MAVTV Canada was created to fill a void. While there is no shortage of grassroots and professional racing content on TV in the US, Canadian racing fans weren’t as fortunate. Until now. 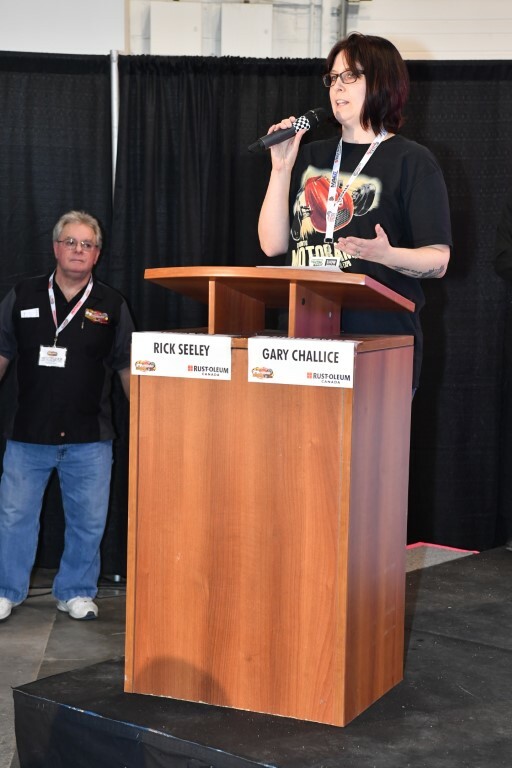 In the time since it first started broadcasting, MAVTV Canada has vastly increased its reach throughout the country via the addition of new carriers, to the point where it is now available in more than five million Canadian homes. 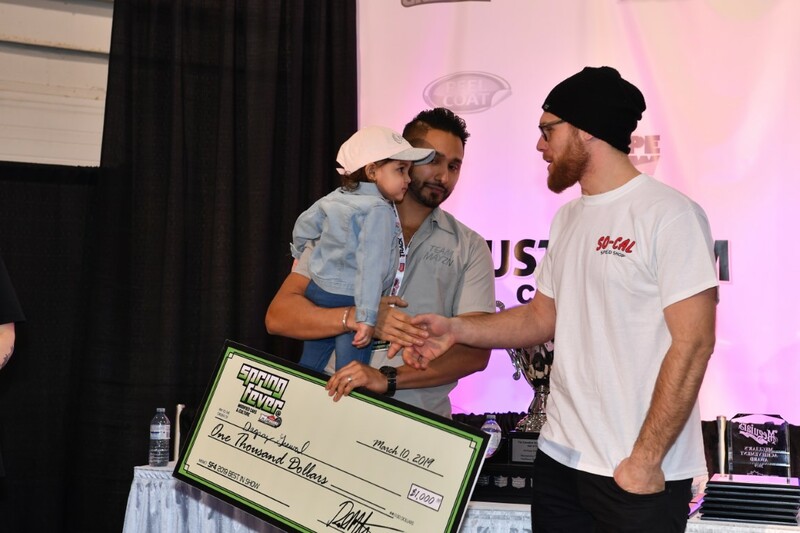 A key component of the network’s mandate is to cover and promote Canadian motorsports of all kinds. As part of that, MAVTV Canada will be on-site and very active at this weekend’s Motorama Custom Car & Motorsports Expo at Toronto’s International Centre, across from Pearson Airport. The show takes place March 8, 9 & 10. 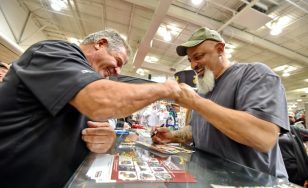 Lou Santiago, the energetic co-host of Discovery Velocity’s The Car Fix, is returning to the Motorama Custom Car & Motorsports Expo in a familiar setting… the Lincoln Electric display (Booth #6202 in Hall 2). 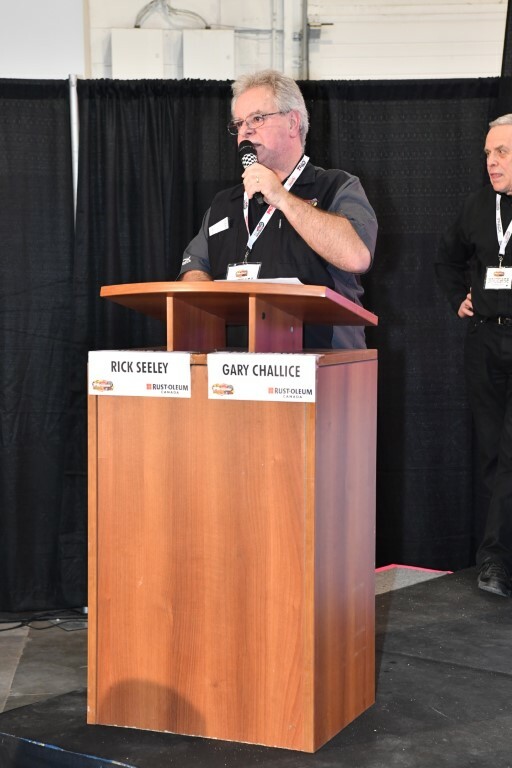 At the show, he’ll be surrounded by an impressive assortment of welding and fabricating products which he’ll use to demonstrate his talents and share some secrets. Motorama takes place March 8, 9 & 10 at The International Centre, across from Toronto’s Pearson Airport. 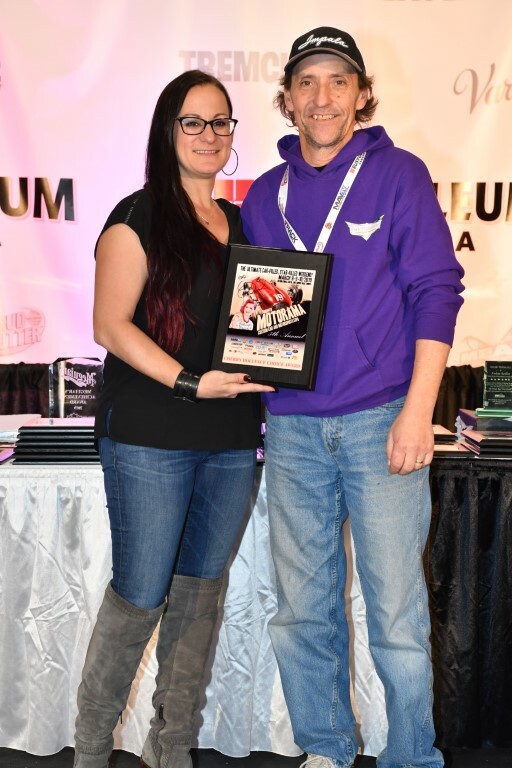 The Toronto Motorama Custom Car & Motorsports Expo has a long history of featuring women who have made an impact in the automotive and racing fields. 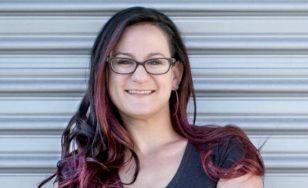 This year’s show, which takes place March 8, 9 & 10 at The International Centre across from the city’s Pearson Airport, will feature another talented, high-profile lady.